With a distinctive eye-catching shape, the Promotional Teardrop Banner is perfect for representing your message fully emblazoned. Specially designed for windy conditions, the Teardrop is specifically created to display everything you need at all times. A fantastic option for outdoor events and activities! Available decoration options include full-colour print on both sides, enabling the use of complicated imagery and gradients that are faithfully recreated for maximum branding exposure and effectiveness. Scroll down for our size chart and wind ratings, along with our top 3 answers about the teardrop flag. Everything you need for setup is included in this package, complete with stand, a carry case and equipment required for setup. Optional extras include a heavy water weight or stake fitting for both outdoor and indoor events. We go the extra mile and provide a swivel on your stake fitting so that your banner will always follow the direction of the wind! Our ground spike is excellent for grassy areas and soft ground, while our cross base with water bag is suitable for hard ground. Single or two side print? This is entirely down to your preference! Two side print doubles your visibility, by ensuring no matter which direction your flag blows your design is still seen, however the trade off to this is that the flag is slightly heavier and doesn't flap around as much and may not catch the attention of passers by. 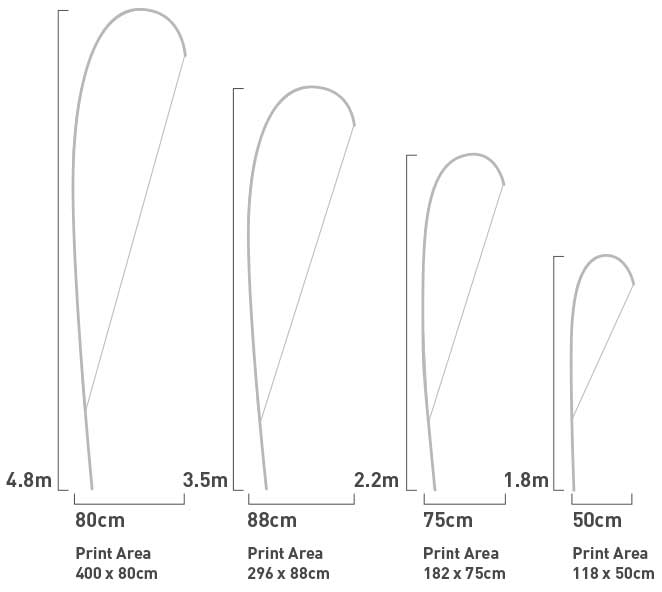 Unless otherwise specified during your order, All of our feather and teardrop flags contain a carry bag, bases and poles, high quality printed flag and any extra items you order such as wall bracket or additional fittings. Businesses looking to boost brand awareness often turn to Tear Drop Flags to achieve this goal. A teardrop banner remains a great choice for a variety of reasons. 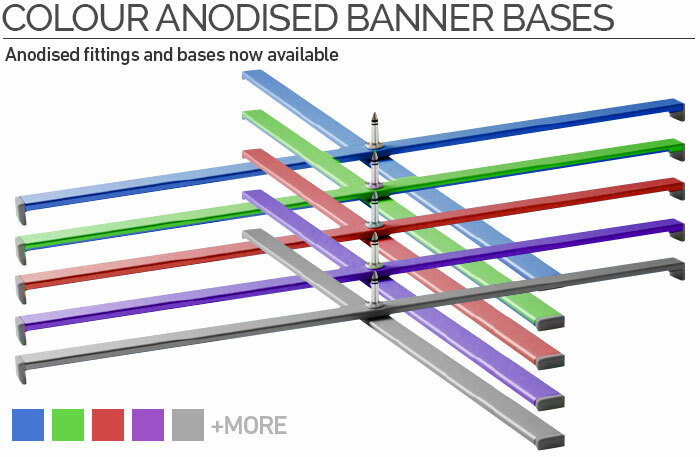 First and foremost, the banner moves in the wind and can be purchased in a variety of shapes and sizes. In addition, they increase the depth and movement of trade show signage and other marketing displays, and they may be used in a variety of indoor and outdoor locations. Consider Teardrop Banners if you are trying to increase the visibility of your business without spending a fortune to do so, as they tend to be very cost effective and provide a great return on investment. Often referred to by a variety of other names, including freestanding flags, promotional flags, custom printed flags, and beach banners, teardrop banners ensure the company's name, logo and/or message are seen from a distance. They may be found at car dealerships advertising great deals on new or used cars and at sporting events, and they are proven to get a brand noticed quickly and easily. Furthermore, they may be placed where they attract the most attention, whether on a building, a fence or a variety of other places, depending on the needs of the client. Best of all, they can be used again and again, so companies get more for their marketing dollars. Teardrop banners are very durable thanks to their unique shape, which is streamlined to resist the wind. Most clients opt to have their information printed at the top of the banner, which helps to attract more attention, as it is in the line of vision of the viewer. Additionally, as the flags may be printed on both sides, companies find they need fewer flags of this type, and this helps to save money, of importance when it comes to many company advertising budgets. One question many customers have when ordering a teardrop banner involves which printing option best meets their needs. The single-side print is done on one piece of fabric, and any printing completed on the fabric can be seen from the other side. The reverse side artwork will be mirrored for the selected image. In contrast, a double-sided print teardrop banner features artwork printed on separate fabric pieces. The artwork can be read from both sides, as the banner features a blackout material in the center of these separate pieces of fabric. Companies know they can count on us for all of their teardrop banner needs. We offer fast delivery, only seven to ten days, and optional rush delivery when required. In the event customers find a lower price, we will beat it, and our pre-production design service is free. The client receives the opportunity to revise the design as many times as needed until they feel it is right. All items needed to set the banner up are included in the package, such as the stand and the carry case. 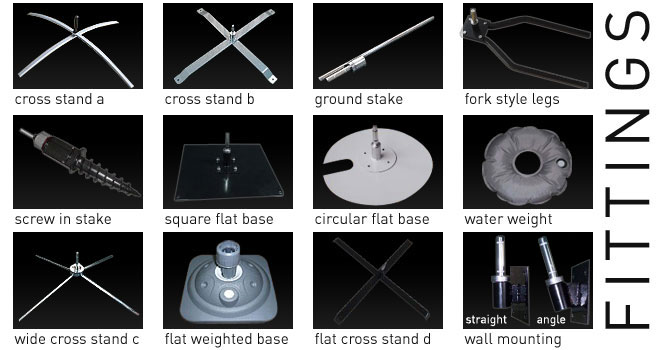 We also stock optional accessories, such as a stake fitting or heavy water weight. Finally, we provide a swivel on this stake fitting to make certain the banner follows the wind direction for optimal results. Every flag we create is made using 320 to 680gsm oxford polyester and meets our strict standards. UV-resisting inks ensure the flag doesn't fade with time, and we make use of top-quality digital printing equipment. To protect the flags from the elements, the flags are covered in a non-toxic formula created for this purpose. Check out the quality of our teardrop banner today, and be sure to check the various size, base and wind rating options to find the perfect flag for every purpose. Teardrop Banners are designed to withstand moderate weather and can be used indoors when desired. Lightweight and popular, the banners can be put up or taken down in a matter of minutes with no need of tools, and they leave a lasting impression in the mind of the viewer. Why not combine small teardrop banners indoor with larger ones outdoors? Doing so will ensure your business gets noticed by all who pass by the flags.